items that they can forage as well as the right amount of nutrients and protein to maintain their health. 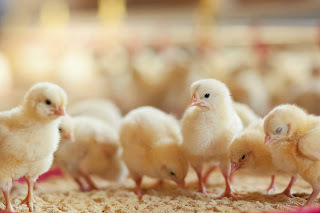 Feed suppliers have special formulations for baby chick feed. It’s available in a crumble version or mash formula, and suppliers refer to it as “starter feed.” If you’ve vaccinated your chicks to protect them from coccidiosis, then feed them an unmedicated feed. If you’ve decided against vaccinating them, be sure to give your birds a medicated formula to maintain their health. For their first six weeks of life, 10 chicks will eat about 20 pounds of starter feed. However, these birds will self-regulate as long as you have the right type of food, so monitor them to make sure they’re getting enough. In fact, as long as you’re using starter feed, you can make it available to them at all times. To give your chicks the best nutritional balance, buy starter feed that features 15 percent to 19 percent protein. You can also feed them scraps, bugs, and worms. Be sure to limit this kind of food because your baby chicks will consider these items treats, and they’ll eat too much. View our chick starter feeds here. Pullets range in age from 15 to 22 weeks old. Birds this age need 14 percent protein in their feed. 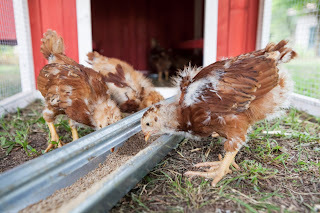 Once your pullets are ready to eat growing mash, you can feed them grain. This will lower your feeding costs. Most chicken owners feed their pullets a mash that consists of corn, barley, wheat, millet, or oats. You can also feed them a combination of these ingredients. To incorporate grain, start with 10 pounds of the ingredient for every 100 pounds of mash. You can then increase the amount of grain until your birds are eating equal amounts of grain and mash. Use a different hopper for each type of feed. When your chickens become 18 to 20 weeks old, gradually remove the growing mash from their pullet feed and begin to substitute laying mash. Make this change over a two-week period. Increase their feed by .8 pounds to 1.5 pounds when winter arrives. View our pullet grower feeds here. To develop feathers and lay eggs, chickens need protein. Commercial hen feeds are formulated to provide the proper balance of nutrients and minerals. These feeds also have the right amount of calcium and protein for eggshell production. Layer pellets usually contain 16 percent protein, which is the right amount for chickens who are laying eggs. In the summer, feed your chickens 2 ½ pounds of feed for every 10 birds that you own. If you don’t heat your chicken coop during the winter months, be sure to give your girls extra food to help them maintain their warmth. In particular, cracked corn is great for this purpose. It’s mostly empty calories, so don’t overfeed or use during warmer months. View our feed for egg-laying hens here. If you compost, consider combining it with your chicken run or range area. These birds love to scratch, so you can take advantage of this natural tendency to manage your compost heap. Your chickens will dig and scratch through a compost heap to search for tasty treats like high-protein bugs, microbes, and green plants. The birds will break down your compost heap quickly, and by giving them access to it, you can reduce the amount of feed that you need to buy. However, don’t add food items to the heap that can rot quickly, as this could be harmful to your chickens. Also, avoid giving them avocados or rhubarb leaves because these food items can poison your birds. Chickens don’t have teeth. To grind up food, a chicken will eat small pebbles, which it stores in its gizzard. When food reaches the bird’s gizzard, the pebbles grind it up to ease the digestion process. Without access to grit, your chickens won’t be able to break down their food, and it will rot in their stomachs. Once they become two weeks old, give baby chicks access to builder’s sand, canary gravel, or parakeet gravel. Sprinkle the substance in their feed, or offer it in a separate bowl. When chicks are more than three weeks old, switch to a grower grit. This substance is coarser. Once they become two months old or older, give them an adult mix. To grow and develop eggs and feathers, chickens need protein. 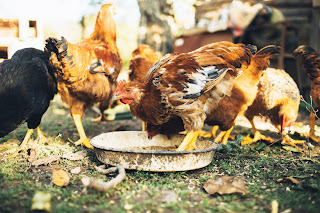 If you buy a commercial chicken feed, then you’ll be giving your birds food that’s been carefully crafted to offer the right balance of nutrients and minerals to keep your chickens healthy. Formulated feeds are available in mash or pellet form. To make sure that your hens obtain the proper amount of calcium in their diets, give them oyster shell. You can buy it online or from your local feed store. Oyster shell dissolves in a chicken’s gut and provides the calcium that a laying hen needs. Keep in mind that you should only give oyster shell to hens that are laying eggs. Chickens who aren’t producing eggs will receive plenty of calcium from their regular feed. Do not supplement calcium if using a homemade or store-bought feed that already contains their full supply of calcium. Shop affordable oyster shell in 5lb. or 55lb. bulk. Give your hens mixed corn to keep them active, but be sure to use it as a treat because it will cause your chickens to gain too much weight. It can also throw off their nutritional balance. In the winter, it’s ok to give your girls a little more to help them stay warm. Offer your chickens garlic to keep them healthy. The birds enjoy the cloves, and you can include it in their wet mash or water. Garlic is an affordable way to improve the health of your chickens. Provide greens for your chickens on a daily basis. They’ll cheerfully eat produce like spinach, cauliflower leaves, and cabbage. Chickens also like to eat grass clippings and dandelions. Don’t feed them lettuce because it has little nutritional value, and if you give them potatoes, be sure to boil the potatoes first. Pamper your chickens with treats like mealworms, but do so with restraint. Since treats make the birds friendlier, owners often spoil them with too many goodies, which is bad for them. If you give your chickens mealworms, limit the amount to less than one tablespoon per chicken. Hulled sunflower seeds are another nice treat since they provide extra protein and are a good source of fat; but again, be sure to spoil your girls in moderation. For even more dietary balance, treat your hens to fruit like berries, melons, and squash. Chickens especially like strawberries, and they are good for your birds. If you give them melons, then include the seeds and the flesh. Winter squash and pumpkins are other food items that your chickens will enjoy. Your birds will happily devour both the flesh and the seeds of these fruits. Most chickens also appreciate an occasional tomato, and when you begin the process of deadheading your garden's flowers, feed them to your chickens. They’ll eat pansies, marigolds, and nasturtiums. If you’re looking for an affordable store-bought option, check out Hen-Tastic, a blend of tasty mealworms and healthy herbs. To maintain the health of your chickens during the winter, feed them cracked corn in the evening because this keeps them warm at night. If you live in an area where it snows during the winter, then the weather will prevent your chickens from their free ranging activities. To keep them happy and active, dangle a head of cabbage from the top of the coop. You can further distract them by cutting holes into a pumpkin. It will add variety to their diet as well as become a new toy. During the winter, you can give your chickens treat blocks from your local pet food store. Use these products temporarily to prevent your birds from becoming bored. While there isn’t much to change diet-wise for your chickens during the summer, you’ll want to reduce the amount of corn and other empty-calorie sources in their feed. It’s also a great idea to add an electrolyte supplement to their water during summer months. Our favorite option, Sav-A-Chick, is formulated to help chickens of all ages regulate body heat during the summer. A chicken’s feathers are 80 percent protein, so when molting occurs, their bodies will generally divert the protein that they use for egg production to the job of growing feathers. While your chickens are molting, give them a small scoop of cat kibble with their regular feed to increase the amount of protein in their diet. When you have to confine your chickens for their health and safety, be sure to diversify their diet. Give them fruits like grapes, as this food choice is nutritious. It will also entertain them. In addition, feed them live bugs like crickets. These bugs are a good source of protein, and your chickens will have to catch them. Broccoli and cauliflower provide balance to their diets. These veggies will also keep them busy pecking. If you decide to give your chickens table scraps, then do so cautiously, and limit them to no more than 25 percent of their diet. Form scraps into a mash with water and layer feed. To produce eggs and stay healthy, your chickens need access to plenty of water. In the summer months, be sure to give them more. Also, if you live in a cold environment, then check their water daily to prevent it from freezing over and becoming undrinkable. If your chickens don’t have water at all times, they could become dehydrated. This may cause them to stop laying eggs or molt. Stock up on affordable range feeders to keep your chickens hydrated. Chickens need a balanced diet. Also, it’s not enough to toss a little feed in their pen when you get up in the morning. Chickens prefer to eat small food portions frequently, so feed them in the morning and at night. During the day, they’ll supplement their diets by foraging for their own tasty treats. When you own chickens, you're not only helping the planet, but you're also gaining new feathery friends and access to fresh eggs. Shop our huge selection of affordable poultry feeders and waterers.